For Ellen Kanner (Huffington Post’s Meatless Monday blogger, and the Miami Herald’s Edgy Veggie columnist), this is a favorite Thanksgiving dish, but you need not wait for a special occasion to enjoy it. Remove stalks and fronds from fennel. Chop fennel bulb into bite-sized cubes, roughly 1 1/2 inches. Add chopped fennel to pot and saute 10 minutes or until tender. Add kale by the handful, stirring gently until wilted, but still bright green, about 8 minutes. Stir in sherry, pepper flakes and cranberries. Recipe may be made up to a day ahead at this point. Cover well and refrigerate. Return to room temperature before proceeding. Spread walnuts on a rimmed baking sheet. Toast for 10 minutes or until golden brown and fragrant. Remove from oven and chop walnuts coarsely. To serve: Gently reheat kale on stovetop over medium heat until heated through, about 8 minutes. Stir in walnuts. Add salt and pepper to taste. This entry was posted in Recipes and tagged Thanksgiving Salads on November 18, 2014 by HPOB. Jicama is a slightly sweet crunchy root vegetable and adds a great flavor to autumn coleslaws. It’s a lovely addition to the vegan Thanksgiving table! Ask for it at well stocked supermarkets and produce stands. If you can’t find it, substitute crisp white turnip. Combine the dressing ingredients in a small bowl and whisk until well blended. Pour over the cabbage mixture and toss well. Cover and refrigerate until needed. 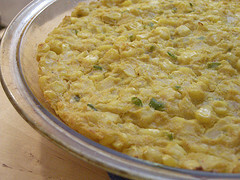 Don’t be fooled by the term “pudding.” The texture of this Appalachian dish is more like creamed corn meets quiche than that of dessert pudding. The outer layer is just firm enough so that you can cut into it like a quiche, but it becomes smooth and velvety once you take a bite. It’s so rich and decadent you’ll deny it’s healthy. Contributed by Lindsay S. Nixon, from The Happy Herbivore Cookbook* (note—for holiday meals, like Thanksgiving, this recipe doubles easily. Use two 9-inch pie dishes rather than one large casserole dish). Preheat the oven to 350 degrees F. Lightly grease a shallow 9-inch pie dish and set aside. Combine 3/4 cup of corn with tofu and non-dairy milk in a blender and pulse until smooth and creamy. Transfer to a large mixing bowl and set aside. Note: Quinoa flour has a nutty and light taste to it that complements corn beautifully, while chickpea flour imparts a nice egg-like taste. However, any flour, including cornmeal, can be substituted if you’re in a pinch. This entry was posted in Recipes and tagged Easy Thanksgiving on November 18, 2014 by HPOB. Here’s a gorgeous salad of spinach, red cabbage, and oranges that adds a burst of color and nutrition to the plate. 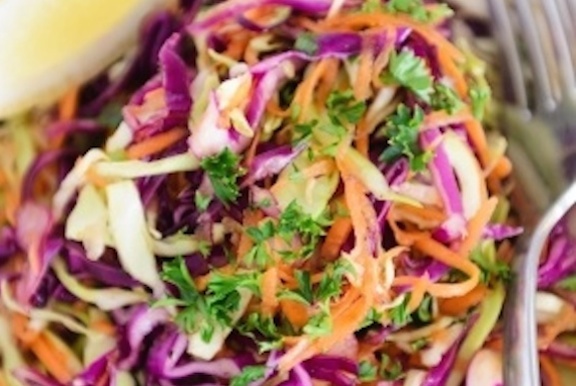 It’s a quick salad for everyday meals and is equally welcome as part of winter holiday meals. Adapted from Vegan Express. Photos by Hannah Kaminsky. I love recipes that are impressive enough to serve guests, yet easy enough to make as an everyday dish. In Vegan Holiday Kitchen, this recipe is offered as a Thanksgiving side dish; it’s so hearty that the addition of a cup or two of beans (yummy with black beans), can make it plentiful entree. Or, to dress it up even more, use it to stuff small squashes like golden acorn or delicata. Can’t find red quinoa? Regular is fine; it will taste just as good, even if it won’t be as photogenic. Photo by Susan Voisin, FatFree Vegan Kitchen. Combine the quinoa with 3 cups broth in a medium saucepan. Bring to a rapid simmer, then cover and simmer gently until the broth is absorbed, about 15 to 20 minutes. If the quinoa isn’t quite done, add an additional 1/2 cup broth (or water) and continue to cook until absorbed. Strip the kale leaves away from the stems. Discard the stems, or slice them very thinly. Cut the kale leaves into narrow strips. Rinse well and set aside. 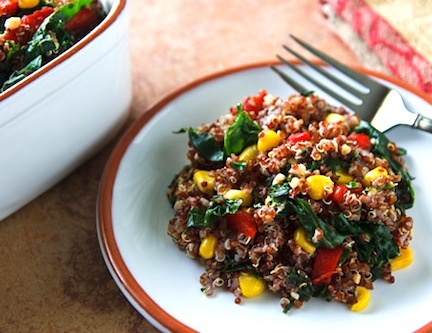 Red quinoa pilaf with kale and cornMeanwhile, heat the oil in a large skillet or stir-fry pan. Add the garlic and sauté over low heat until golden. Add the kale, stir together, and cover; raise the heat to medium and cook until wilted, about 2 to 3 minutes. Add the remaining ingredients and cook, stirring frequently for 4 to 5 minutes longer. Transfer to a serving container and serve at once, or cover until needed. This entry was posted in Recipes and tagged Thanksgiving sides on November 18, 2014 by HPOB. I’ve long enjoyed making and serving bread puddings, which offer a great way to use up the last few pieces of bread in a loaf and vegetables that are getting a bit tired. This is sort of a cousin to baked stuffings, but with more emphasis on the vegetables than the bread. For a gluten-free version, simply make this using gluten-free bread. However, this works best with a really sturdy crusty bread. Using a softer bread can make this come out mushy. Place the torn bread in a mixing bowl and pour the nondairy milk over it. Stir to moisten the bread, then set aside until needed. Heat the oil in a large skillet. Add the onion and sauté over medium-low heat until the golden and just beginning to turn brown. Add the vegetables of your choice and just enough water to keep the skillet moist; cover and steam until just tender, 5 to 8 minutes. Drain off any liquid that has remained. Combine the vegetable mixture with the bread in the bowl and stir in the remaining ingredients. Mix well, then transfer to a shallow 1 1/2-quart baking dish. Sprinkle a some sesame seeds over the top. Bake for 35 to 40 minutes, or until the top is golden and just beginning to turn crusty. Let stand for 5 to 10 minutes, then cut into squares or wedges to serve. You can use a single vegetable, or combine two or three. You’ll need a total of 4 to 5 cups raw vegetables, prepared as instructed below. Make sure to browse more of VegKitchen’s vegan casserole recipes. This entry was posted in Recipes and tagged savory Thanksgiving dishes on November 18, 2014 by HPOB. I find that the smooth, sweet butternut puree tastes just as good as sugar pumpkin in the classic pumpkin pie (vegan style)—perhaps even better! Once you’ve got the squash or pumpkin baked, which I do ahead of time, making this nourishing pie is a snap. It contains no eggs or dairy, of course, but no one will notice the difference. Photos by Hannah Kaminsky of Bittersweet. Preheat the oven to 350 degrees F..
Pour the mixture into the crust. Bake for 40 to 45 minutes, or until the mixture is set and the crust is golden. Let the pie cool completely. Cut into 8 wedges; if you’d like, top each with a swirl of Vegan Whipped Cream. To bake butternut squash or sugar pumpkin and make it easier to handle, see our Vegan Minute Video. Bake it a bit longer than the video instructs — you want to be able to pierce all the way through the squash or pumpkin easily, to make it easy to puree. If you want to make this in a hurry, you can use a 16-ounce can of pureed pumpkin—but it won’t taste as good or fresh! This entry was posted in Recipes and tagged Easy on November 18, 2014 by HPOB. Simple as all get-go, I might argue that it’s even better than that ubiquitous pumpkin bread that everyone and their best friend feels the urge to make around this time of year. Warm, creamy, and comforting, it’s the perfect dessert to ward off those autumn chills while celebrating the season’s bounty. It’s a snap to customize depending on your preference; consider the spices as a mere suggestion, and a handful or two of nuts, chocolate, or dried fruit never hurt anything. Recipe and photo contributed by Hannah Kaminsky, author of My Sweet Vegan* (reprinted by permission of the author). Preheat the oven to 350º F. and lightly grease an 8 x 8-inch baking dish. Cut the bread into 1-inch cubes and set aside. Whisk together the pumpkin puree, cornstarch, sugar, spices, and salt in a large bowl. Once smooth and thoroughly combined, add in the non-dairy milk and rum, and stir until the mixture is homogeneous. Toss in the bread cubes and crystallized ginger, and use a wide spatula to gently stir everything together. Pour the mixture into your prepared pan and smooth it evenly across the bottom. Bake for 45 to 50 minutes. The edges should appear set, but the interior will remain quite soft and moist. Good bread pudding should be very moist, so be careful not to over bake it! Let cool for about 15 minutes before serving. You can either take the time to make nice, neat slices like I did, or just grab a large spoon and scoop it out onto plates. Serve warm with ice cream and Caramel Sauce. This entry was posted in Recipes and tagged Pumpkin on November 18, 2014 by HPOB. This delicious and very pretty cake was contributed by Dynise Balcavage from The Urban Vegan: 250 Simple, Sumptuous Recipes from Street Cart Favorites to Haute Cuisine. * It’s a lovely dessert to serve at Thanksgiving and Christmas, but you need not wait for a special occasion to make and enjoy it. In a small saucepan over medium heat, melt together 1⁄4 cup of the Earth Balance and all the brown sugar. 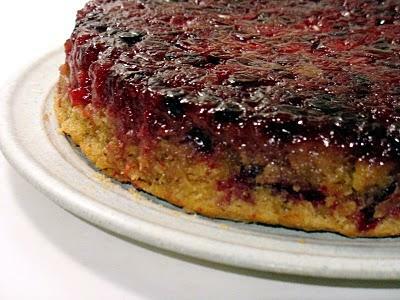 Pour into oiled cake pan and arrange cranberries evenly on top. In a large bowl, mix flour, granulated sugar, baking powder, and soy flour. In a medium bowl, mix milk, vanilla, lemon oil or zest, and remaining 1⁄4 cup Earth Balance). Using a mixer, blend the wet ingredients into the dry ingredients and mix well. Spoon the cake batter over the cranberry mixture and bake for about 45 minutes or until knife inserted in center comes out clean. Remove cake and run a knife along the circumference of the pan to separate the cake from the pan’s edge. Allow cake to cool for at least 15 minutes—ideally 30 minutes. Place plate on top of cake and quickly invert and remove pan. Visit Dynise Balcavage at The Urban Vegan. This entry was posted in Recipes and tagged Thanksgiving dessert ideas on November 18, 2014 by HPOB. This entry was posted in Recipes and tagged Lily Fredrickson, potato, squash on October 14, 2013 by HPOB.